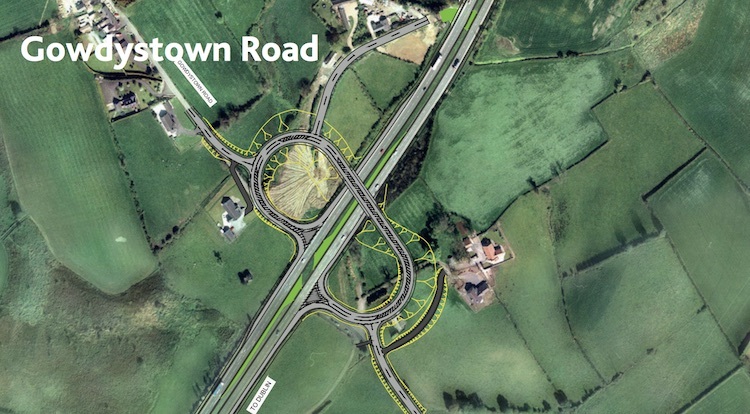 To grade separate a final set of 5 junctions on the A1, build a link road at Milebush Road Dromore and close up all central reservation crossing points between Hillsborough and Loughbrickland so that right turns are no longer permitted. General area map. See also Google Earth screenshot below. This proposal (also referred to as "A1 Junction Improvements Phase 2") is motivated by the desire to improve safety on the A1, which is plagued by crashes occurring at the notorious "gap" junctions - places where vehicles can turn right across the central reservation. 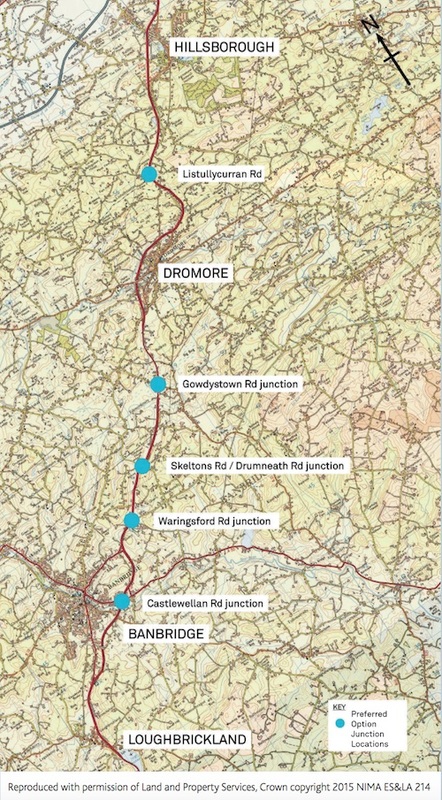 These proposals will add four new grade-separated junctions in rural areas - 1 between Hillsborough and Dromore and 3 between Dromore and Banbridge - which will not only improve safety at these specific junctions, but also allow u-turns, hence allowing other nearby junctions to be reduced to left-turn movements only. Other side roads will be completely closed up. An onslip will also be provided at Castlewellan Road, Banbridge. Once all the junctions are built and side roads restricted or closed, the central reservation will be closed up completely between Hillsborough and Loughbrickland. This will turn this part of the A1 into an "Expressway" with no right turns allowed. You can view a map of the locations of the proposed grade-separated junctions by clicking here [DRD map]. The maps below show the proposals for each junction in turn plus the Milebush Link Road in Dromore. The Milebush Link Road will connect Milebush Road to the existing grade-separated junction at Hillsborough Road, Dromore (which opened in June 2005). These graphics are all taken from the Stage 2 Scheme Assessment Report published in November 2015. Central crash barrier closed up from Hillsborough Roundabout to Dromore Road grade-separated junction on the Hillsborough Bypass. Work began 6 Feb 2017 for six weeks. Distance 2.3 km. Cost £230,000. Central crash barrier closed up from Springwell Loanin to Bannview Road Bridge on the Banbridge Bypass. Work began 11 Feb 2018 for three weeks. Cost £200,000. Central crash barrier closed up from Bannview Road Bridge to Castlewellan Road Bridge on the Banbridge Bypass. Work began 4 Mar 2018 for 3-4 weeks. Cost £250,000. Central crash barrier closed up at an agricultural crossing on the Dromore Bypass between Banbridge Road and Lower Quilly Road, and an agricultural crossing on the A1 between Glen Road and Dromore Road, Hillsborough and 1.3 km of new crash barrier in two sections. Work began 4 Mar 2019 for 5 weeks. Cost £200,000. The last of these four was built by a private developer in 2006, as part of the Bridgewater Park retail park. The Hillsborough roundabout upgrade was subsequently included as part of the A1/M1 Sprucefield Bypass. 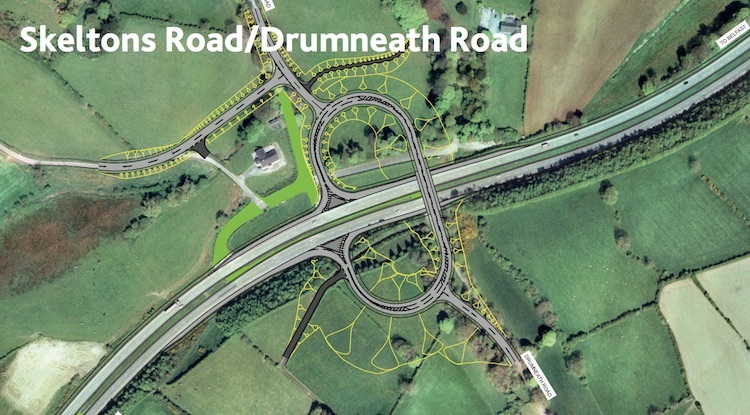 In the "Investment Delivery Plan for Roads" published in April 2008, the plan was re-launched with these two proposals removed, and the proposed junction at Dromore also removed. The B25 proposal remained, and was joined by three others to make the current list of four. 7 Apr 2019: As expected, DFI have now published their Environmental Impact Assessment and draft legal orders for this scheme. The public have until 28 June to give their responses. Having completed their design process, the scheme outlined in these documents is now the final proposal, the one that is likely to be examined at a future public inquiry. The timing of this is uncertain, but I do get the impression that DFI are currently working quite hard to get this scheme shovel-ready. It's listed in the Investment Strategy NI as to go out to tender in December 2019, so I would expect to see a public inquiry convened around the end of 2019. The total cost of the scheme is now being quoted at £67m, which is a lot higher than the £40-50m being quoted in 2016. The scheme does not, however, currently have a funding allocation which would have to be made by a Minister or, in the continued absence of such, a senior civil servant. If funding were to be found, construction getting underway in the second half of 2020 is plausible. 6 Mar 2019: This project continues to edge slowly closer to construction. DFI Roads have said that the Environmental Impact Assessment (EIA) and draft statutory orders will be published later this month. The EIA is the document that sets out DFI's rationale for the scheme and also the impacts it will have. The draft statutory orders will include the Direction Order (that gives DFI the power to build a new trunk road) and the Vesting Order (that compels landowners to sell the necessary land to DFI). It is all these documents that will be examined at the public inquiry that is likely to follow. The Investment Strategy NI web site is still listing this scheme as to go out to tender in December 2019, which is feasible and could see construction getting underway in 2020, though in the absence of an Executive I'm not sure how much we can rely on these dates. Meanwhile, work started on 4 March on the 4th "micro" scheme that is slowly seeing the central reservation gaps closed up between Sprucefield and Loughbrickland. This one will see two more gaps closed up - a somewhat overgrown agricultural crossing on the Dromore Bypass between Banbridge Road and Lower Quilly Road here, and an agricultural crossing on the A1 between Glen Road and Dromore Road, Hillsborough here. Once closed, two stretches of crash barrier will be erected, totalling 1.3 km. These may seem like minor works, but every one of these represents a danger, and needs its own legal order to close, so it's vital that DFI take their time to deal with them all individually. Work is to be completed by mid April at a cost of £200,000. 23 Jun 2018: Although small scale works on closing the central barriers have been ongoing for some months now, we are still awaiting the "big" element of this scheme which is the construction of the four new grade-separated junctions and other links. Interestingly, the Investment Strategy for Northern Ireland Pipeline contains an entry suggesting that this "big" part of the scheme is to go out to tender by December 2019 with a total project cost of £40-45m, an amount sufficient to build all the outstanding elements. Two notes of caution - DFI have repeatedly said that the scheme could be broken into small elements as and when money is available, so putting all four major junctions out to tender at once feels a bit unlikely. It's also worth commenting that without a functioning Executive it's hard to put much certainty in this sort of thing. What we CAN deduce is that this scheme is at least regarded as a high priority once the current flagship projects are underway (A5, A6, York Street). The only other non-flagship schemes that seem to be operating to this timescale are the A4 Enniskillen Bypass and the A24 Ballynahinch Bypass project. 13 Mar 2018: Another public consultation (the fourth for this scheme) happened from 15-21 February. In terms of the new grade-separated junctions, what was presented was almost identical to 2017's proposals. The planners recently uploaded a marvellous, and surprisingly atmospheric, visualisation of what the Waringsford Road grade-separated junction would look like to YouTube here. In the most recent consultation there have been some amendments to the proposals for side roads, principally that Backnamullagh Road will now be stopped up and a link road provided to Listullycurran Road. Therefore in the latest plan, 9 side roads are to be closed completely and the remainder converted to left-in/left-out (LILO). Following public feedback, increased merge/diverge lanes have been added to several LILO junctions. If you missed the consultation, you can see the material here. Meanwhile, work to close the central reservation on the A1 between Hillsborough and Loughbrickland is continuing. The closure of all crossing points on the Banbridge Bypass between Springwell Loanin and Bannview Road Bridge was undertaken between 11 February and the start of March, and between Bannview Road Bridge and Castlewellan Road Bridge beginning on 4 March. The cost was £200k for the former £250k for the latter. 5 Nov 2017: According to details at the bottom of a DFI press release, this scheme has been granted €1.5million (£1.35million) of European Union funding through the Connecting Europe Facility for ongoing design work. Every little helps, as they say! 28 Jan 2017: As noted in the previous update, Transport NI will on 6 February commence the first phase of works that will eventually see all gaps in the central reservation of the A1 closed up between Hillsborough and Loughbrickland. 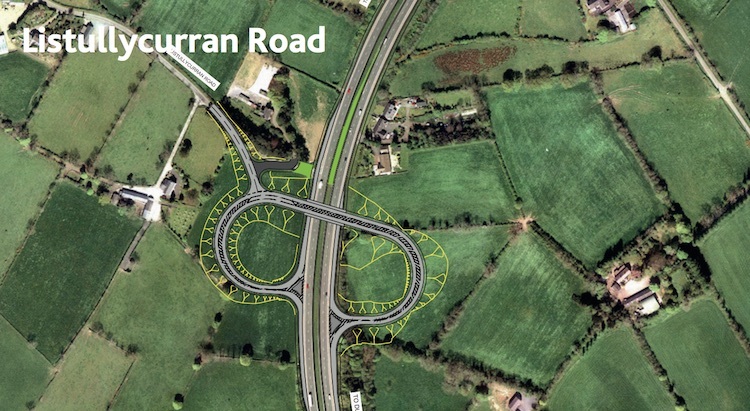 This first scheme will close the gaps on the 2.3 km stretch between Hillsborough roundabout and the Dromore Road grade-separated junction at the southern end of the town. Work will take six weeks and will cost £230,000. This is an extremely welcome move, as these dangerous gap junctions have resulted in multiple deaths in recent years. This scheme represents just under 10% of the stretch that is to be upgraded, so let's hope the remainder of the works can be carried out before too long. There has been no indication since late 2015 of any further progress on the four new grade-separated junctions and one new sliproad that are planned as part of the scheme. However in a Question for Written Answer in the Assembly just before Christmas (AQW 8693/16-21) the Minister said (referring particularly to the grade-separated junctions) "A significant amount of development work has already been carried out for the proposal, however, much remains to be done. The current phase of this work involves the completion of the detailed design and Environmental Statement in preparation for taking the proposal through the Statutory Procedures, which will likely include a Public Inquiry." So don't expect these junctions in the near future. 2 Dec 2015: The DRD have finally published the "Stage 2 Report" that I suspect was approved by the DRD board in March 2014 (see previous update). The report recommends a single, preferred option for each of the four proposed grade separated junctions plus a link road in Dromore called the Milebush Link Road, plus a single onslip at Castlewellan Road, Banbridge. The report also lists all the junctions between Hillsborough and Loughbrickland that will be completely closed and those that will be reduced to left-in/left-out only. There is a lot to digest there, but for those who want the bottom line they have also published a public information leaflet that summarises it. On the basis of this report I have re-written the information at the top of this page to reflect the preferred options and included a map of each proposal. The public information leaflet does not mention a cost, but the full Stage 2 report gives a total cost of £42.8m. The grade-separated junctions all cost between £3.5m and £4.7m, except for Skelton's Road at £6.5m. The Milebush Road cost is £1.0m, while closing up or modifying the various side roads is listed as £5.6m. £2.5m is given for closing up the central barrier, £1.7m for accommodation works (maintaining access to property). A final £8.5m is for planning and contingency costs. This total cost of £42.8m is well within the broad estimate given in 2012 of £30-45m which is good news. The DRD may choose to appoint a contractor to build the entire scheme at once, or they may choose to award smaller contracts for the individual elements of the scheme (as happened with the previous grade-separated junctions on the A1). This latter approach would allow the scheme to begin with more limited funding. Meanwhile, a death yesterday on the A1 which occurred at one of the gap junctions between Loughbrickland and Newry (which the DRD have NO plans to remove) has again drawn attention to this issue, and raises the question of whether the scope of the A1 junctions project should be extended all the way to Newry. 9 Nov 2015: Although the DRD's web site used to state that the "Stage 2 Report" had been approved by the DRD board on 23 March 2014, this information has disappeared again from the equivalent page on the DRD's new web site. Now it is saying that consultants were appointed during September 2015, presumably to progress the design and settle on a single preferred option for each junction). So it's not clear exactly what has been happening since the last public exhibition two years ago, especially since at that time they said they expected the preferred options to be published by "early 2014", but which has still not happened. But at least there seems to have been some recent movement. I do hope the DRD engineers take the "big picture" view and resist the pressure and temptation to keep lots of these minor junctions open, since people are continuing to die at them (three since the previous update to this page). A little inconvenience for a small number of road users could save the lives of others. 18 Dec 2014: The Minister was asked about progress on this set of schemes in the Assembly last week and he gave some details. As we know, a public consultation was held just over a year ago in November 2013 where several options were given for four junctions and one design for the fifth junction (see update for Dec 2013 below). The Minister has now said that following that consultation "significantly fewer closures of minor road junctions with the A1 are being proposed than previously". This is presumably due to concerns about local people having to make long detours. When I first read this I was horrified as I thought it meant they were proposing to retain some "gap" junctions (where vehicles can turn right across the central reservation) but it seems that this is not what is proposed. The proposal is to keep a number of side roads open as left-in/left-out only. This still isn't ideal on a high-speed road such as this (since it means vehicles turning left onto the road from a standing start) and it is unfortunate that it means that the standard of the upgraded road will not be as great as it could be, but it is still better than the current situation. I at least hope that the left-in/left-out junctions are provided with sufficient acceleration and deceleration lanes to reduce the chances of rear-end type collisions. 16 Jul 2014: The DRD seems to have moved this scheme from the "forward planning schedule" to the "preparation pool" (although it now appears in both lists!). The former are schemes that are planned for the longer term, but aren't expected to be built soon, where as the latter are expected to proceed to construction within a few years. In practice, schemes can sit in the preparation pool for years and years, and even then require a funding allocation before they can be built, so it probably doesn't really tell us anything about timescales for this particular scheme. But what it does tell us is that Roads Service regard this as a worthy scheme that ought to be put amongst the others that are being developed to a point where construction could actually take place, rather than as a vaguer aspiration. My expectation is that these five junctions will continue to go through the planning process together but will then be put out to tender as smaller, separate schemes, perhaps allowing their construction to proceed with smaller, individual funding allocations. 25 Mar 2014: According to the DRD's web site, the "Stage 2 Report" was approved by the DRD board on 23 March 2014. I'm not sure how seriously to take the actual date, since the information appeared on the web site ahead of that date, which is actually a Sunday, so it may be a typo. However, the underlying point is probably valid, ie that the scheme has now advanced one more step. In December 2013 (see previous update below) DRD presented several options for each junction. The Stage 2 report has not been published online, but may well include the selection of a "preferred" option in each case, informed by the public consultations that took place in November. There is still no word on a construction timetable, and no funding has yet been allocated, but the manner in which this scheme is proceeding steadily through the statutory processes suggests that it is seen as important. Because the scheme consists of five separate junctions, it could well proceed as five separate construction schemes rather than one big scheme. This would mean that they would not all have to be built at the same time, and could be tendered progressively over a period of time. 4 Dec 2013: The second round of public consultations happened as expected in November. All the information is online here. In my previous update I said that they'd probably present a "preferred" option in each case. In fact, this was not the case. While they have reduced the number of options, they have only settled on a "preferred" option in one case, and the final decision will not be taken until early 2014. The list below describes what is proposed at each junction. In each case the link is to Roads Service's PDF that shows these on maps (please let me know if these links are broken, as Roads Service sometimes change URLs). At Listullycurran Road, there are three options. The first two are variants on a flyover located at Listullycurran Road. 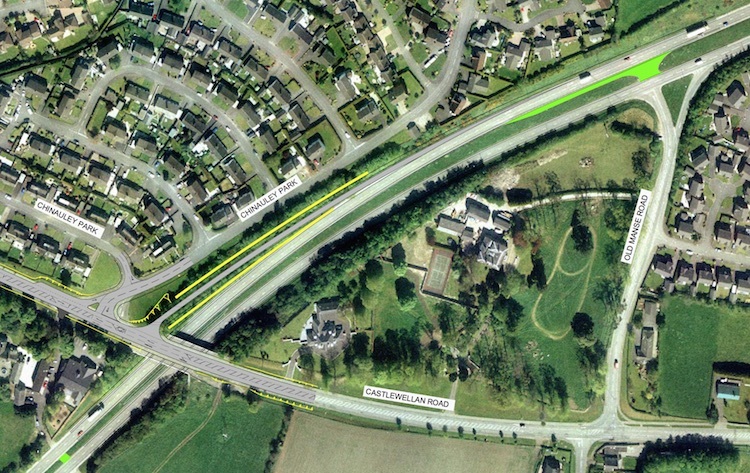 The third option is an underpass located a few hundred metres further north at Backnamullagh Road. At Gowdystown Road, there are three options. All three consist of a flyover, differing only in the layout of the sliproads and precise location of the bridge. Two of the options would require the demolition of an existing residential property. At Skeltons Road there are three options. Two consist of a flyover located close to Skelton's Road, while in the third the bridge is located further east with link roads connecting them back to the existing local road network. Due to the lay of the land here, all three options would require substantial earthworks, consisting of both cuttings and embankments (such as a possible cutting through this hill). At Waringsford Road there are three options. This junction is doubly challenging due to the close proximity of a quarry which can affect the stability of the bedrock and hence requires care when constructing a bridge. All three consist of flyovers. Two of the options are very similar, featuring a C-shaped pair of sliproads. The third option is more spread out, looking more S-shaped and involving longer connecting roads. At Castlewellan Road, Banbridge, where a northbound onslip only is proposed, there is only one option. This is because the existing site is so constrained by existing development that only one option is really possible, ie a straight onslip onto the A1. The same site constraints mean that the sliproad would have vertical walls (similar to this one in Omagh). In this proposal the right turn from the northbound A1 onto Old Manse Road here would be closed off, so that only three of the four possible turning movements would be possible at the completed junction. Roads Service say that they expect to have completed the process of selecting a preferred option for the first four junctions by "early 2014". After that they'll work on the legal documents they need to produce. The principal one of these is the Environmental Statement which identifies the impacts that the schemes would have on various aspects of society and the landscape. After that, there will almost certainly be a public inquiry. All these steps will probably take at least two years. After that, progress will depend on funding. Roads Service have to bid for funds to build a scheme, so at this point we can't say when construction might take place, except that it won't be within the next couple of years. As this is one of the key opportunities for anyone interested in or affected by the plans to express their views, I would urge as many people as possible to turn up, see what is proposed and express your opinions and views to the DRD representatives. The report also states that the cost of the first four schemes is in the range £30-45m (almost double what was estimated in 2006) while the cost of the final, smaller, scheme at Castlewellan Road is estimated to be £3.6m. The cost-benefit ratio comes out between 2.648 and 2.914, which is quite good and indicates that the scheme would bring almost three times as much benefit as cost over the 60 year assessment period. However the most significant benefit - that of saving lives at these dangerous gap junctions - cannot truly be assessed in this way. 6 April 2012: According to the Roads Service web site, the Stage 1 report was approved on 20 February 2012. No further information is given, and the minutes of this meeting have not been published yet. In most schemes a "Stage 1 Report" usually includes a fairly detailed analysis of various options and determines which options that are feasible and which are not. If approved, this leads to detailed design work. It is probably the same as the "preliminary options report" referred to in the previous update. It has not been published online as far as I can tell, so for now this is all we know. 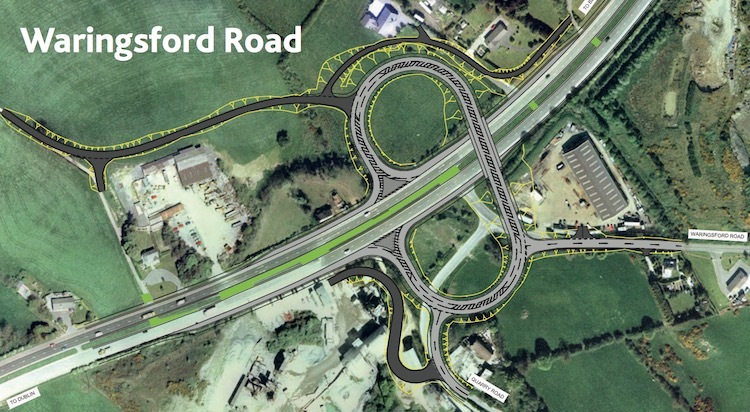 5 June 2011: According to the minutes of a Roads Service board meeting which took place on 25 February work is progressing on the "preliminary options report" for these four junctions. This presumably is looking at how feasible it is to grade separate each junction, and how this might be achieved. 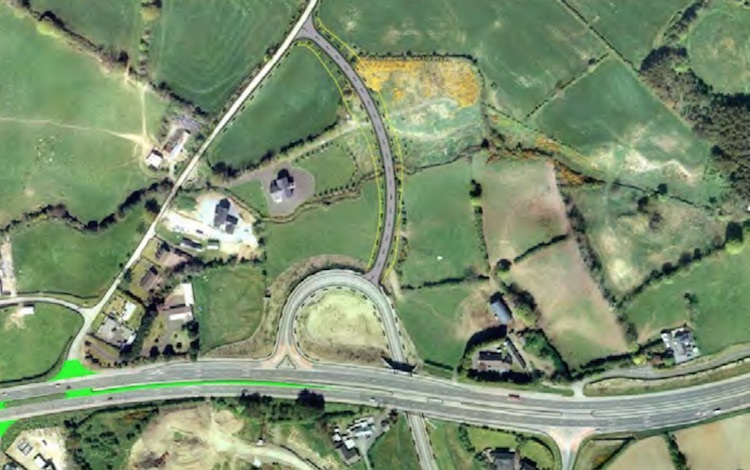 It also confirms that this project will result in the central median barrier being closed up continuously from the M1 to Loughbrickland (but with no mention of the recently completed section from Loughbrickland to Beech Hill which has some central reservation crossings). The minutes also note that there will be another round of public consultation, but no timescale is given. 20 Jan 2010: According to the Dromore Today, a limited consultation exercise was carried out in late December and early January. The consultants wrote to a range of interested parties, and also sought the names of those individuals or organisations who should also be consulted. More detailed consultations are to be carried out later. Bizzarely, the newspaper article in question focuses entirely on what the reporter calls the "massive disruption" that the scheme will cause to a small number of people living on the side roads in question, while completely ignoring the fact that closing up right-turns on the A1 will undoubtedly save dozens of lives in the years ahead. Those who will no longer be able to make right turns on the A1 will undoubtedly feel inconvenienced, but surely not to the same degree as the families of those who have lost their lives at these dangerous junctions. 29 Aug 2009: In their report to Banbridge Borough Council in June 2009, Roads Service added the following comment: "The provision of a northbound on-slip linking from the A50 Castlewellan Road, Banbridge, to the northbound carriageway of the A1 Banbridge Bypass is also being considered." This proposal is in addition to the four junctions already being discussed. There is currently a link road connecting the A50 to the A1 via a T-junction here. However, since the plan is to close the central reservation on the A1, this link road would become accessible only to southbound traffic. A northbound onslip would retain access onto the A1 once the central reservation was closed. Only traffic leaving the A1 northbound would not be catered for, and this movement is restricted by the proximity of the Rathfriland Road junction about 500 metres to the south west.